"For MABE, educational equity in Maryland means providing access to essential academic, social, emotional, and economic supports in order to engage each student in rigorous instruction with appropriate educational resources to achieve their highest potential." We share this belief with The National School Board Association. "Equity Matters" was released at the National School Boards Association's 2018 Annual Conference in San Antonio, TX and highlights the importance of equity in education. Equity Matters - NSBA from National School Boards Assoc. on Vimeo. Maryland’s districts benefit from sample policies (ASBJ, April 2019) | The pursuit of educational equity is rooted in the legacy of Brown v. Board of Education. This pivotal Supreme Court education decision celebrates its 65th anniversary this year. Today, we are still striving to reach the aspirations of Brown for each of our students, and the critical mission of educational equity rests at present with the Every Student Succeeds Act (ESSA) of 2015. Equity Matters: NSBA's Advocacy Agenda 2018-19 | NSBA will continue to work—with and through our federation of 49 state school boards associations and the U.S. territory of the Virgin Islands, and their more than 90,000 school board members—to inspire and lead a thoughtful dialogue and to advocate for policies that truly enhance learning opportunities. 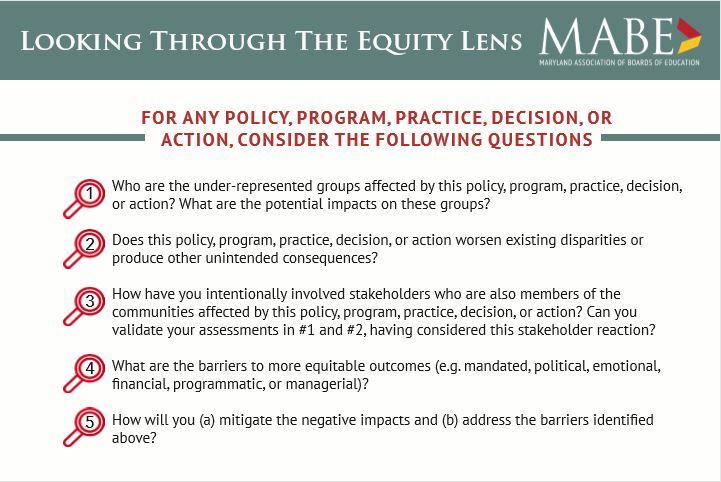 During the 2019 MABE Annual Conference, the Equity Ad Hoc Committee debuted their Equity Lens. These five questions, compiled on by the committee members, should be considered when making a decision for any policy, program, practice, decision or action.